Left, from Trajal Harrell’s The Return of La Argentina. Courtesy of the artist. Center, from Lisa Jarrett’s How Many Licks? II (Conditioned No. 13,763), (2017). Courtesy of the artist. Right, still from Love is the Message, The Message is Death, (2016). Courtesy Arthur Jafa and Gavin Brown’s enterprise, New York/Rome. This first transmission (6.4.18) features Amber Musser on Trajal Harrell’s The Return of La Argentina, Faye Gleisser on Lisa Jarrett’s How Many Licks? II (Conditioned #13,763), and Huey Copeland on Arthur Jafa’s Love is the Message, The Message is Death. Trajal Harrell’s The Return of La Argentina begins with Harrell taking a few sips of orange juice, eating a few potato chips, and then preparing a bowl of food. Harrell tells the audience that he starts every performance with a bowl of yogurt and peach jam and describes his food intake with precision. The performance is part narration, part eating, part feeling. Everything is slow and exact. Through this ritual, Harris summons the ghost of Kazuo Ohno and his famous performance Admiring La Argentina. Ohno’s piece, which he produced when he was seventy-one, builds on his memory of watching La Argentina, Antonia Mercé, an Argentinian born Spanish dancer, in Tokyo when he was in his early twenties. The Return of La Argentina, then, brings together Ohno—young and old—La Argentina, Spain, Tokyo, and the United States (I’ve seen versions of it performed in New York at MoMA and Participant, Inc). Cross-pollination is Harrell’s specialty. One of his previous choreographic projects is a series in which Judson Dance Theater meets the Harlem ballroom scene. Judson Dance Theater, based in Greenwich Village, New York in the 1960s, imagined that dance could convey the beauty of ordinary movement and challenged the limits of what constitutes performance. The Harlem ballroom scene also pushes at the limits of reality and performance through voguing, walking, and drag. Harrell’s dances fuse essential elements from both—the affective intensity of ballroom and the ordinary movements of Judson—in the bodies of dancers. The Return of La Argentina is also about dance history, but it adds butoh, a form of avant-garde dance developed in Japan after World War II that emphasizes the otherness of the body, slowness, and the transformation of consciousness, to the mix. Harrell’s projects chart minoritarian lines of flight by turning to multiple moments and modalities of the avant-garde in order to open possibilities of movement, affect, and history. On the one hand, we can see the ways in which these transhistorical and transcultural juxtapositions highlight the importance of coalition; working toward what José Esteban Muñoz might term a queer utopia. 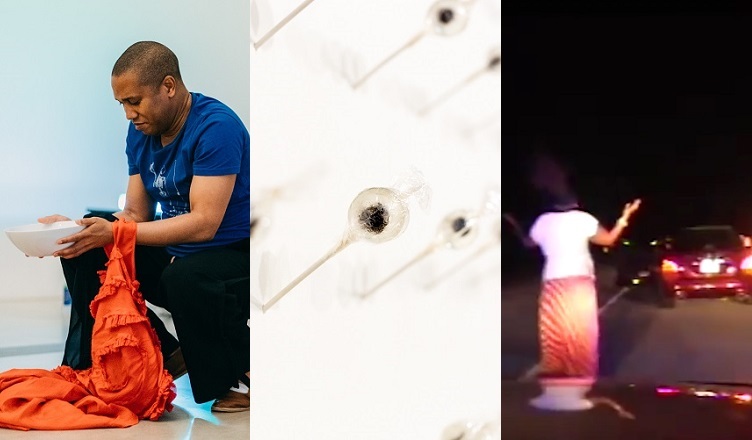 On the other, Harrell’s focus on the avant-garde’s aesthetic relationship to forms of non-normativity—Mercé’s Flamenco meets Ohno’s butoh meets Harlem ball culture—transforms the everyday from the banal into diffuse zones of possibility. In this performance, for example, eating a bowl of yogurt and jam becomes a portal into pre- and post-World War II Japan; butoh’s strategies for cultivating a politics of non-respectability; and for denaturalizing the movements and functions of the human body. Though there is much to say about butoh on its own what interests me about Harrell’s project is what it says about blackness. If Admiring La Argentina was already a dance reliant on layers of memory, how do we think about a queer black man’s practice of citation? What does it mean that Harrell cites Ohno and Mercé in order to come toward possibility? Here, I should be clear that I am thinking about practices of citation as occupying a distinct affective register from appropriation. I imagine citation as an embodied performance of attachment in which the bodies and histories mingle queerly and are articulated through gesture. Are we seeing Spanish/Argentinian femininity? Japanese femininity? Blackness? Though we might approach this question of femininity psychoanalytically, I am interested in what it means to think about the fact that Harrell cites/embodies/disappears into a particular feminine spectacular—La Argentina. Is there something to be said about feminine singularity in relation to this performance of citation? What might this suggest about the fungibility [or not] of racialized femininity? In particular, I am interested in the ways that Harrell’s blackness and queerness enable his body to embody the gestures of Ohno and Mercé. 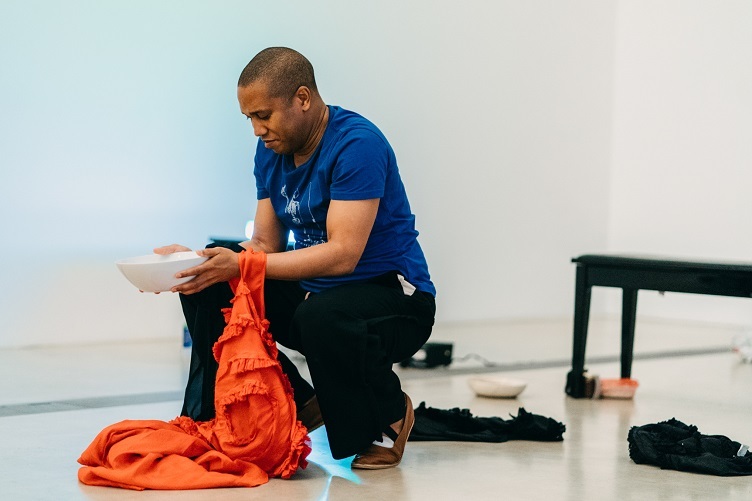 As the performance proceeds Harrell holds a ruffled floral dress in front of him as he struts, stomps, and twirls through the audience. The performance ends when he strikes the ceramic bowl with his spoon and then bows and walks backward out of sight, sometimes waving, sometimes not. In these movements we can see gestures toward Mercé’s investment in Flamenco and an echo of her famous castanets (in Ohno’s performance he dons a dress and dances to a recording of Mercé’s castanets). Harrell’s performance both summons La Argentina and enacts distance. It is notable that he does not wear the dress and that the framing moments of the dance—the extended performances of eating and bowing—refer to butoh and the distortions that are made possible when the everyday is made slow and strange. I dwell on this question of femininity because I cannot quite figure out what the limits of legibility are for us to imagine La Argentina’s femininity. Is it the dress, gesture, or sound? Thinking with this abstraction matters, I think, because it allows us to understand some of the ways through which we might enact minoritarian coalition. It also illuminates the ways in which femininity and the everyday can become entwined and political. It is here that I see Harrell’s investment in finding and prioritizing feminine avant-garde lines of flight as enabling us to expand ways of thinking about strategies that blackness can employ against the demands of white supremacy. Amber Jamilla Musser is associate professor of Women, Gender, and Sexuality Studies at Washington University in St. Louis. She will be associate professor of American Studies at George Washington University starting in September. 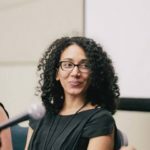 She is the author of Sensational Flesh: Race, Power, and Masochism and the forthcoming Sensual Excess: Queer Femininity and Brown Jouissance.